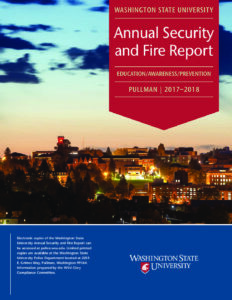 Washington State University is committed to preventing campus violence and ensuring a safe and healthy environment for all faculty, staff, students, and/or visitors. Established WSU policies, such as the Workplace Violence Policy, Domestic Violence Policy, etc., will serve as the mechanisms for resolving situations of violence and/or threats of violence. In conjunction with the established policies, all situations of violence and/or threats of violence will be taken seriously. Sign up for emergency alerts on your account at MyWSU. Familiarize yourself with the campus safety plan for your WSU campus. For non-emergency assistance or response call 509-335-8548. For emergency assistance call 911. Purpose: The purpose of the Safe Environment Teams is to identify, assess, collaborate, and manage situations indicating violent or potentially violent behavior by individuals or groups. Individuals who are concerned with an individual’s or group’s threatening behavior, or who have witnessed or are subject to violence or a threat, should call WSU Police at 509-335-8548. Call 911 for immediate threats and assistance. If the concern is not for an immediate threat call HRS at 509-335-4521. Concerned about a co-worker or colleague’s wellbeing? Has their behavior caused you to worry about his or her potential actions? If there is a possibility that a co-worker or colleague may immediately harm her/himself or others, call 911. WSU Police provides immediate assistance for emergencies and conducts criminal investigations as predicated by law for incidents within the WSU community. WSU’s position on domestic violence in the workplace, and guidelines for dealing with domestic violence issues in the WSU community, are detailed in the Domestic Violence Guidelines. Child abuse continues to be a terrible societal problem that unfortunately extends to colleges and universities. In addition, recent laws have broadened the legal requirements for reporting child abuse to the proper authorities. The 2012 Washington Legislature enacted Senate Bill 5991, which requires all higher education employees to report suspected child abuse or neglect. In compliance with the Drug-Free Schools and Communities Act Amendments of 1989, the University developed the Drug and Alcohol Abuse Prevention Policy and Program. This policy prohibits the unlawful possession, use, or distribution of illicit drugs or alcohol on University-controlled property. In addition, WSU complies with the Drug-Free Workplace Act of 1988. This program provides educational and training programs and prohibits the use of controlled substances in the workplace. WSU Cougar Health Services – Health Promotion: Cougar Health Services – Health Promotion offers a range of services related to substance use, including: counseling, groups, workshops and outreach programs, consultation, and assessment to WSU students, faculty, and staff. Office of the Ombudsman: The Ombudsman is designated by the university to function as an impartial and neutral resource to assist all members of the university community, and to protect the interests, rights, and privileges of students, staff, and faculty at all levels of university operations. Alternatives to Violence on the Palouse on Pullman Campus: Alternatives to Violence of the Palouse (ATVP) is a private, non-profit organization that provides free, confidential help for victims and survivors of domestic and sexual violence, friends and non-offending family members, with a focus on prevention education and community outreach. Representatives are available to meet with WSU students and employees 24 hours a day. ATVP’s campus location is in room G40, the Washington Building, Pullman campus. Appointments can be scheduled by contacting 509-332-4357.